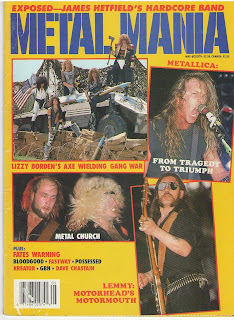 Welcome back to the wonderful world of Metal Magazine collecting. Today, we jump back in the chronovisor and dial it back to late 86/ early 1987. 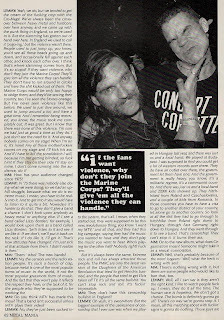 Sir Lemmy Kilmister and Co. were in fine spirits, out and about in support of their 'Orgasmatron' LP. Over 21 years have passed since this printed and while reading it you'd swear it was conducted yesterday. 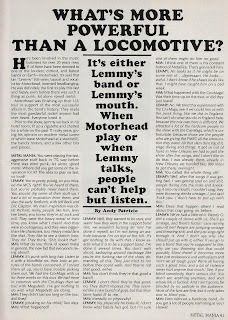 Motorhead never change, neither does their leader. A straight shooter since the day he was born, Lemmy remains at the top of the heap when it comes to true ambassadors of Rock N' Roll. 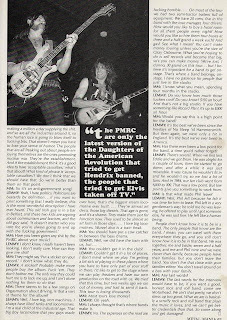 Some good stuff in here including some choice words about Dave Mustaine and Megadeth. Before I forget, inspiration for this look back came from a fellow blogger, Mark DeVito and one of his homes on the web, SKETCHPAD. So do some history reading, do some Holiday shopping, crank some music and all's well.